Ford announced internally that it has pulled the plug on the US Ford Focus Active due to tariffs. A press release will go out. Development has stopped entirely, there are no plans to assemble Focus locally. Ford is reassuring employees that Ford is the least vulnerable to continued tariff pressures and that Ford doesn't see a need for economy cars going forward because of SUV electrification. It's a shame, I thought the Focus Active looked sharp and it's one less vehicle for a company that doesn't have many new vehicles to launch. Obviously this means more customer attrition than predicted. Last edited by Assimilator; 08-31-2018 at 11:25 AM. Ouch. I was thinking that Active would have been a good seller, as the only vehicle close to a car that Ford brand will sell in the near term. glyphics and HotRod like this. I never expected it'd be a volume seller as I expected it'd be a premium offering. Oh well, fuckk em if they can't take a Trump! No cars at Ford dealers by 2021 (but the Mustang). This will be a disaster. Oh well, looks like the Mustang will eventually be the only Ford car in the North American lineup. @wingsnut, with the US Focus Active cancelled, which vehicle would you recommend to those looking for a sub-$24K brand-new vehicle? PS: Ford seems eager to give Changan Ford some new customers (to offset lower sales in China?). 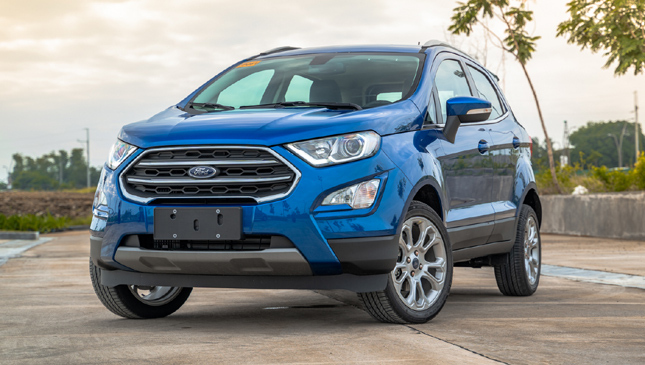 The 2018 EcoSport for the Philippines is imported from China (photo below), the pre-facelift model was sourced from Thailand. So is this a "flip of the switch" model if/when tariffs are reduced/go away? According to Autoblog, no. Even if the tariffs are dropped Ford will not be reversing this decision. They have stopped development on the Focus Active for the US and reassigned/pocketed those assets. So no, Focus Active is off the books permanently. It's also unlikely that the tariff situation will be resolved to Ford's satisfaction, and they certainly can't invest further with this uncertainty anyway. It's also probable Ford will have to further cut product plans once NAFTA 2 is finalized since they may have to reduce their Mexican output. Either way, Ford is facing extremely stiff headwinds and uncertainty, they will have to be very flexible and just ramp up the cost cutting to balance out the tariffs. There are always solutions out there, I could even see Ford partnering with another Automaker to make products for them, especially economy products. We may just have to move Ford into a more innovative outsourcing model, especially as the market contracts for all automakers and building cars in the US becomes more expensive and new car ownership falls out of reach. Last edited by Assimilator; 08-31-2018 at 06:16 PM. pffan1990, 70 Stang and HotRod like this.